So, there I am in Portola, CA last August. It’s getting late in the day, and I’m standing on the South Gulling Street Bridge. 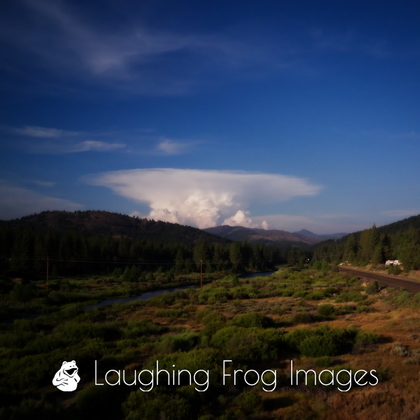 I’ve got sunshine, great light and this absolutely killer cumulonimbus cloud with an anvil in the distance against a great blue sky. There’s a westbound grain train at the east switch (see the white dot about 1/4 in from the right and about 1/3 of the way up from the bottom) waiting to enter the yard. I’m waiting. The train is waiting for clearance. I’m waiting. The train is waiting. We’re both waiting. And waiting. And as we’re both waiting, the cloud starts to dissipate. I wait. The train waits. The cloud dissipates. The cloud is now essentially formless. And the train begins to move west…. You can find this image, and those of the train entering the Portola Yard in the Union Pacific – former Western Pacific gallery on Laughing Frog Images. The 2015 Portola Railroad Days event is from August 21-23, 2015. While in Portola, don’t miss the Western Pacific Railroad Museum. 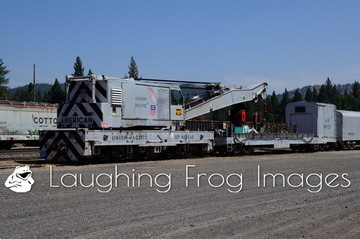 Don’t forget to check out the Western Pacific Railroad Museum Gallery on Laughing Frog Images! Camera and details: Nokia Lumia Icon 929, ISO 100, f2.4, 1/2000 sec, converted to jpg from a dng original. The Feather River Express laid over in Portola, CA for two nights, giving The Frog a full day to explore Portola Railroad Days and the Western Pacific Railroad Museum in Portola. The Western Pacific Railroad Museum is one of the more notable railroad museums in that they not only have a great collection of locomotives, but also passenger and freight cars from the Western Pacific and connecting lines. And – you can also rent a locomotive and be an engineer for an hour or two. Who out there can honestly say they never wanted to run a locomotive? Who, I ask! 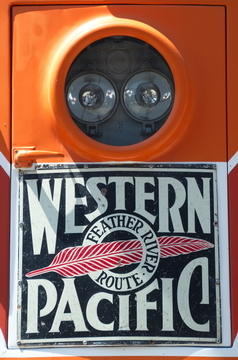 The Western Pacific Railroad ran between Salt Lake City / Ogden Utah and Oakland, CA. It was acquired by the Union Pacific Railroad in 1983. The Western Pacific Railroad Museum Gallery is a reminder that there was a time before graffiti, and that railroads did paint things other than black and red. Railroads even had slogans in those days! And, who knew that the Strategic Air Command had command centers on the rails? Great museum. Great area. What else can be said? For a look at the sights and sounds of modern railroad power in 1952, as well as a look at passenger cars from that era, check out a few short video clips on Laughing Frog’s YouTube channel. This is a view-only gallery (at least at this time). If you like what you see, consider making a visit to the Western Pacific Railroad Museum to experience it for yourself, or at least make a donation so that others can continue to enjoy the museum and the artifacts for decades to come.